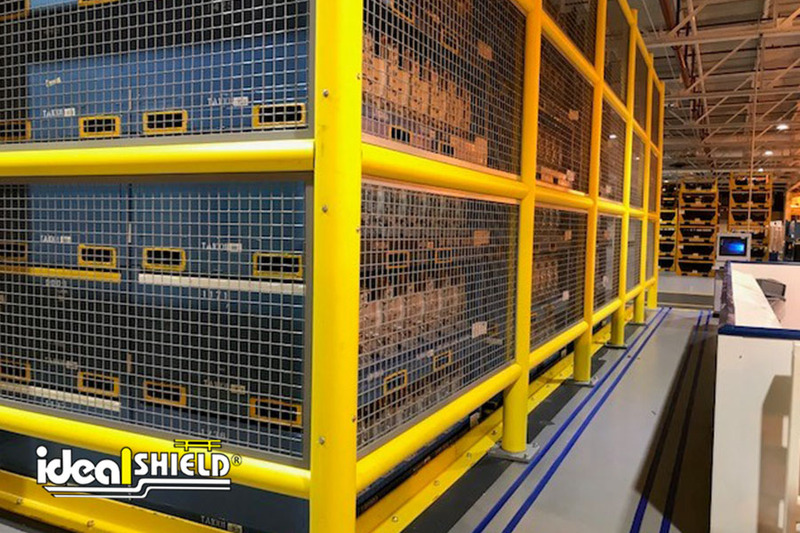 Ideal Shield Safety Wall Guard Systems maximizes floor space by providing strong and sturdy protection for vertical storage of pallets, crates, and containers. Designed to ensure your facility maintains its open floor plan, our Safety Wall System is the perfect alternative to building foundation walls which blocks light, visibility, and air flow. 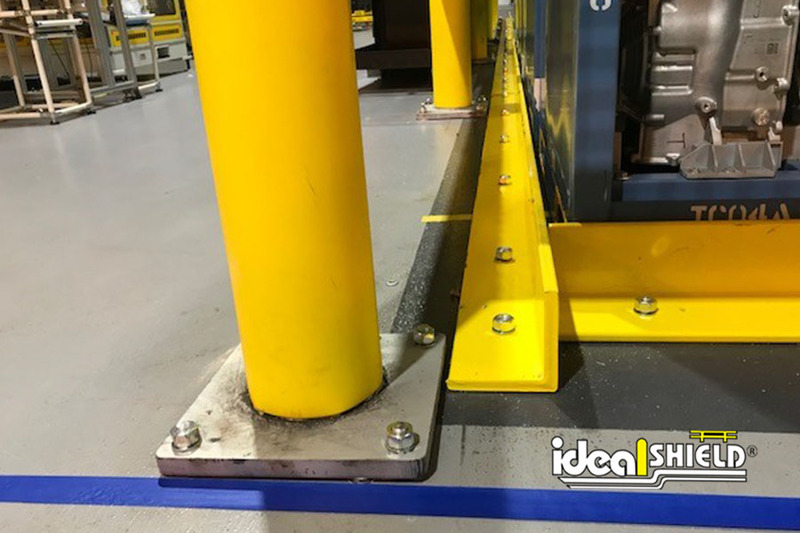 The Safety Wall posts and guard rails are customized to suit your needs or the needs of the material that you are stacking. 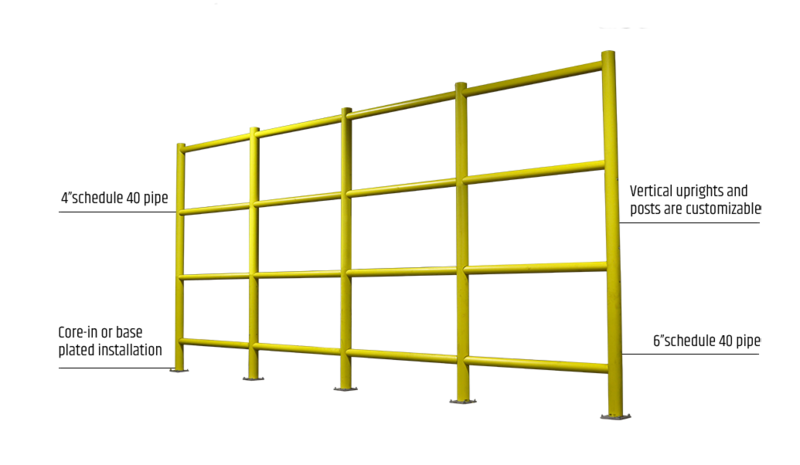 This oversized guardrail is designed to help protect your facility’s critical assets including the workers and expensive equipment and machinery. 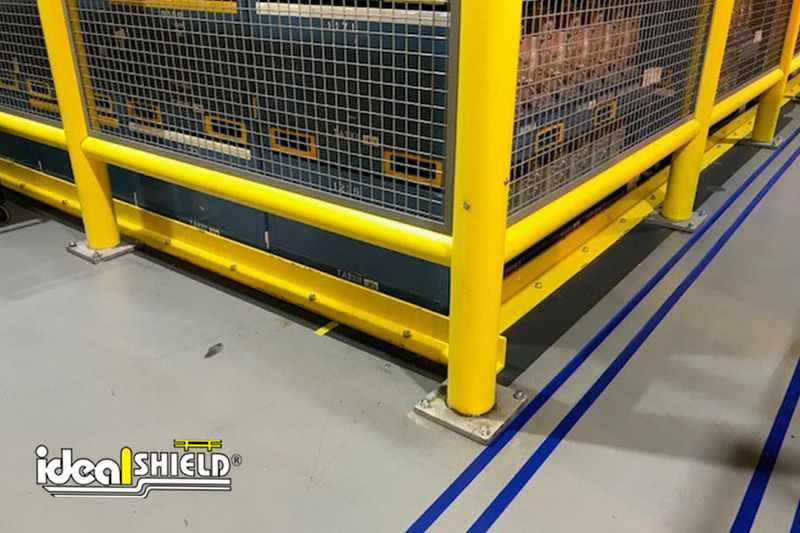 But the benefits are more than just great protection as, like all Ideal Shield safety guardrail products, our maintenance-free HDPE plastic covers eliminate the need to paint ever again. 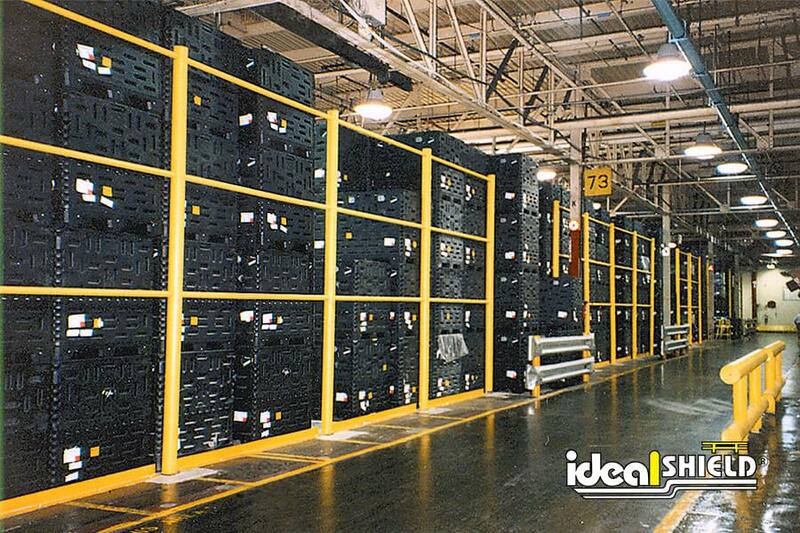 Alleviate your safety concerns of pallets or materials falling on your employees by installing Ideal Shield’s Safety Wall System. Plastic getting dinged up and dusty? Don’t replace the whole wall- just re-sleeve it! Standard Guardrail is made of 4’’ sch. 40 steel pipe rails and 2 1/2 sch. 80 steel pipe posts. The guardrail can withstand a 12,000 lb. forklift traveling 4 mph. Heavy Guardrail is made of 6’’ sch. 40s steel pipe rails and 4’’ sch. 80 steel pipe posts. The guardrail can withstand a 12,000 lb. forklift traveling 8 mph. Ideal Shield’s Heavy Guardrail System is the strongest guardrail on the market; it can withstand multiple hits from a 12,000 lb. forklift traveling 8 mph. The guardrail is modular, delivers to site fully assembled and never requires paint. Lastly, the system can be placed with 6” to 8’’ of a wall which saves valuable floor space. Our standard lengths are 4’, 6’, 8’, 10’ and 12’ sections. For continuous runs, we recommend that you use as many 12’ sections as possible and space each section 6’’-8” apart. You can install our Guardrail a number of different ways: 1) You can surface mount using anchor expansion bolts (3/4” x 6”). 2) On application of 27” and shorter you can use a 5 1/8” core bit, core hole depth of pavement and drop the railing into place thus making the railing modular. On installation of 28” or higher, you can add steel floor sleeves so your railing is still modular 3) You can cement the railing into place for a permanent installation. Why do the posts and railings appear to be loose upon delivery? 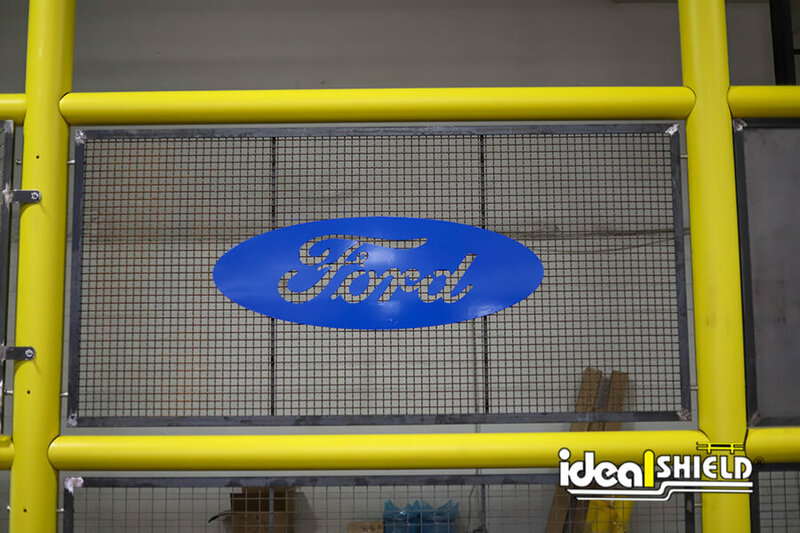 We use a no-weld process which allows the guardrail to disperse energy upon impact, creating a stronger, more durable guardrail. Once assembled, the posts and base plates will tighten into place and be stable for contact.